Admin: We have ended another fiscal period with a small budget surplus. Our City Clerk, Trina, has been continuing to work with our CPA to make adjustments that insure the books accurately depict our financial position. Projects: Online bill pay for water bills is complete and available to all residents. Residents are able to receive their invoices electronically via email and pay for city services online. As always, paper bills will still be available for residents who do not want electronic statements. The Preventative Maintenance project is well underway. There is a new form that allows PWA workers to complete information about their jobs, to as to record the knowledge into an online repository that will allow new employees to learn more effectively. The online resource will also house manuals, diagrams and other supporting materials. REAP grant application has been submitted to OWRB for the water meter project. ACOG REAP grants are still pending for the remaining 4 grant applications. The School project is preparing to start. They have asked the City to perform necessary building inspections. Our contract building inspection service, IBTS, will perform the necessary inspections for the project. Cost will be covered by the permit inspection fees. 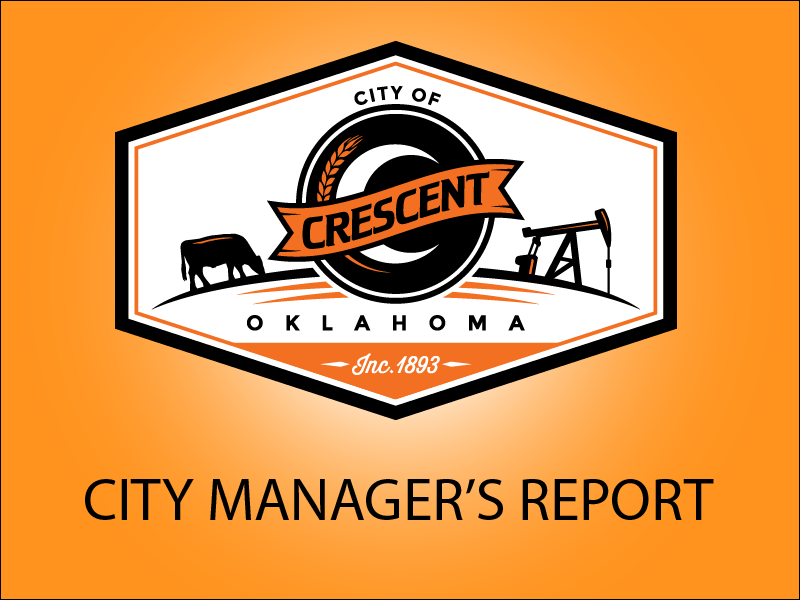 Mowing: The city is continuing an aggressive mowing program on the city image properties. Mowing and weed eating the city infrastructure properties including, lift station, lagoons, fresh water wells. Response from the public continues to be positive. Roads: Continuing to use inmate labor to improve the roads. Due to rain, we have seen delays on our weekly maintenance goals. We will continue to prioritize the roads and make progress on repairs. Wastewater: The lift station grinder remains out of service. Haynes is waiting on parts from the manufacturer before they can repair and reinstall it. We returned the Ultrasonic sewer survey equipment to ACOG. We completed the survey on the West side of town, but did not have the time/personnel to complete the rest of the town. ACOG is allowing other towns to use the equipment, but will allow us a second loan when we are ready for it. The pivot continues to need constant maintenance to keep it operational. The city will need to have an irrigation contractor evaluate it for repair or replacement. Fresh Water: Inspections passed. Waiting for the final inspection and signoff of the water standpipe. Several minor defects have been identified but the contractor believes they have been corrected at this time. Four residential services and a fire hydrant on Broadway are currently being moved to the new service main. Well 1 remains offline. ACOG can provide a subterranean survey to help the City determine if re-drilling the current well or drilling and moving the pump is the best option. Library: Operating smoothly. Last “Movie in the Park” event of the season was moved to the community center because of weather. Might need to re-evaluate the license next year.